Alley is a very sweet girl who LOVES attention. She is approx 7 months old, and looking for someone to play with. 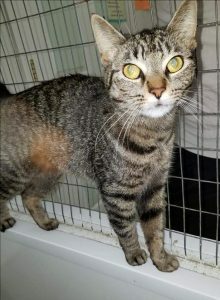 Alley came to us because she had gotten loose from her owners and they thought she was impregnated in her jaunt outside. They decided they didn’t want a pregnant kitty, so they refused to allow her back in. Some very nice folks heard what was going on and brought her here. The worst twist to her story is that when she was spayed it was confirmed that she was not pregnant. Alley, however is determined not to let her past hold her down. She is loving every person who walks by her, and looking for a new furever home! She is young and playful, and gets along with everyone and every thing she has met so far! To you have room in your home and heart to help this little girl learn what love and family really means?